1. Iron the interfacing onto the back (wrong side) of the black fabric. I used flannel, or you could cotton quilting fabric for the road. You could also use felt, but I really liked the flannel and cotton look and feel. Felt doesn't seem to wash as well, if you plan on washing this. With Wonder Under you don't have to sew. You can iron it in between the road and the yellow fabric, and it will fuse the two fabrics together. 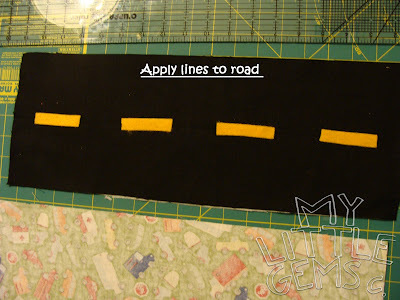 You can sew around the yellow lines too, if you want to reinforce them. Either way- your choice- but the Wonder Under really does keep it on. Once your road is finished, set it aside for now. 1. The car piece that is 18 1/2 inches by 9 inches will be your pocket. Fold it in 1/2 and iron. Your pocket front will now be double thickness with the fold at the top of the pocket. 3. Mark and pin the pocket piece every 3 inches, leaving an extra 1/4 inch on both ends of the pocket piece for seam allowances. So you will have 3 and 1/4 inches on the two ends, and all the pins in between will be every 3 inches. If it isn't exact, don't worry about it. It will still work and still fit cars- even if one pocket is a little too small or too big. Put your pocket piece aside. Pick up your road piece. The ribbon attaches right where the lines in the road are at. 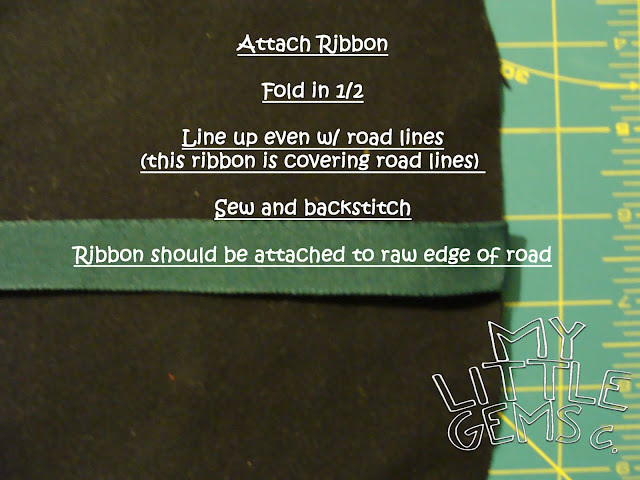 So fold your ribbon in 1/2 and sew it and back stitch it right on the edge of the road so that it is even with the yellow road lines. NOW we are going to attach our road to our pocket piece. 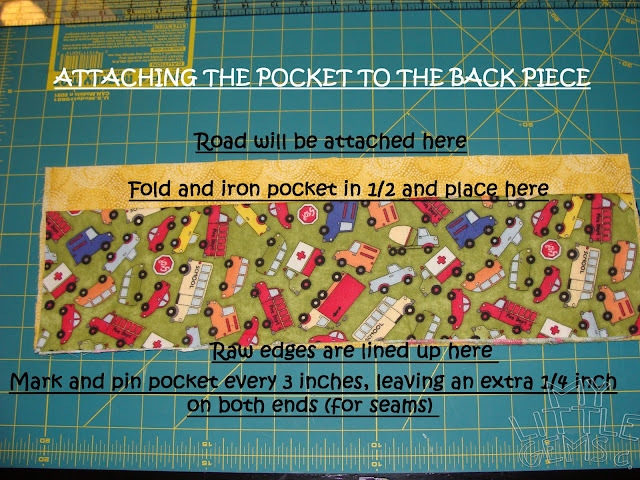 With right sides together, sew the long side of the pocket piece to the long edge of the road piece. 1. 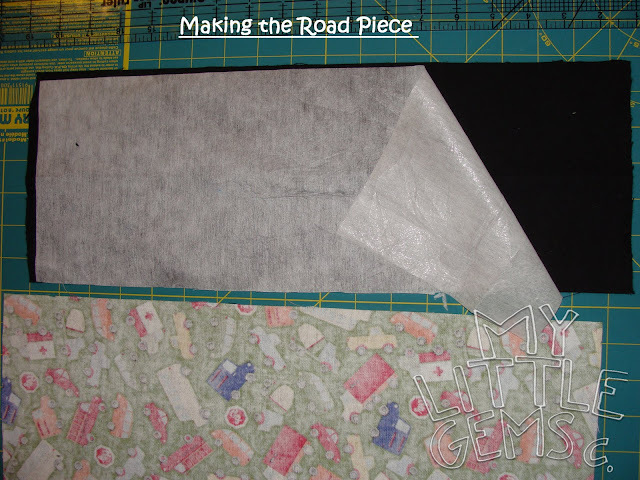 Placing right sides together, place the large car piece (18 1/2 inches by 12) on top of the pocket and road piece you just sewed. Pin all edges together. Sew 1/4 inch all the way around, leaving 3-4 inches open along the long edge of the road side. 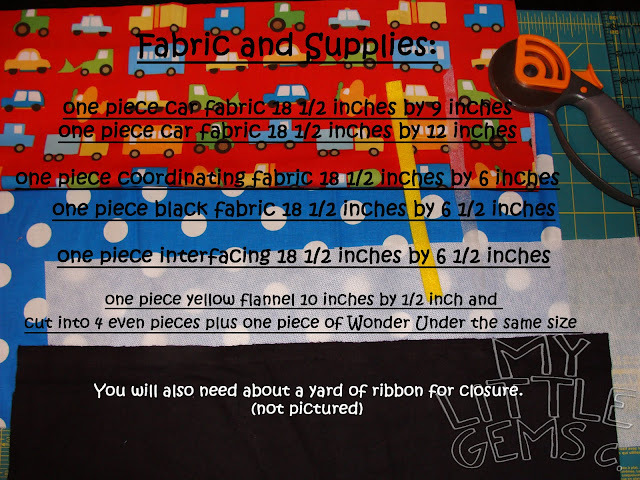 Make sure to catch all layers, but make sure you don't catch the end of the ribbon in your seams. Make sure you catch the end of the ribbon you already sewed on inside of your seam. Trim your seams. Turn right side out. Press. Now you are ready to top stitch. When top stitching, sew opening closed. Top stitch all the way around the edge of the road, close to the edge, and outside edge of the pocket. I top stitched along the top edge of the pocket backing too, so that on the backing, there are two lines down the center, and stitching all the way around the edge. Fill it up with cars, and enjoy your new toy!! If you make one of these, will you please leave me a comment and link it to this post? thanks! I would love to see yours! Leave a comment if you have any questions and I'll comment back to you with the answer. AND NOW FOR A LITTLE GIVE-A -WAY!! In my etsy shop, I am selling already made ones, and kits. With this post, I am giving away a kit that includes all the pieces you need to make your own. I am also giving one away made. Leave me a comment if you want to enter! And we'll have the give-a-way end Thursday of this week. I would love to win one and I follow your blog! I'd love to win, it is super cute. I added myself to your follower list too. oh I loved these! Thanks for sharing the love! Enter me, and I am one of your faithful followers!! You have some of the best ideas. That is so cute!! My friend sent me the link to this and I think it is just so cute!! Sharla, Camryn would LOVE this! I follow your blog (and once in awhile talk to you in person:) I will go right now and follow your etsy/ subscribe, comment etc.! I WANNA WIN THIS ONE!!! This is such a great idea for little guys! I am definitely going to have to try this if I don't win :) Oh, and I am a blog follower!! Of course you're on my favorites on Etsy and I follow your blog. I love your site and so wish we lived closer! 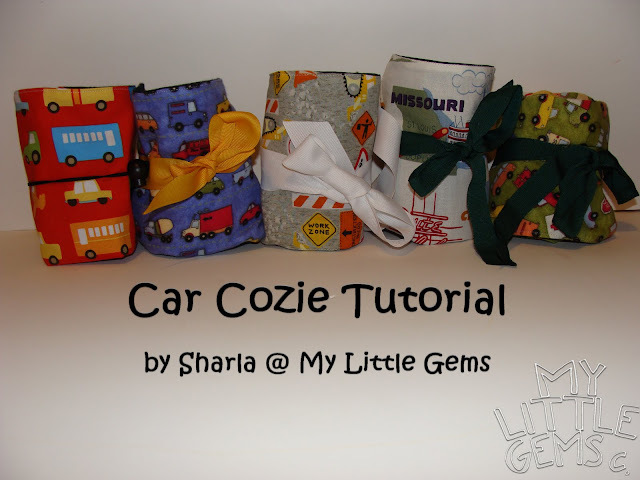 This car cozie is such a good idea - you're amazing! THanks for the chance to win! This is a great idea...I have legos and cars all over my car/house/diaper bag, you name it! My little boy (who is missing trick or treating because he just got sick :( would love to win. Super cute! Definitely on my "to make" list for Christmas!! this is a great idea! i have 3 little boys who would love this. thanks for the tutorial! Genius! I love seeing sweet crafts... for BOYS!!! I'd love to get one of your kits! Genius! I just found your tutorial. You're very clever! I think I'll make one for my grandson. This is SO CUTE! What a fabulous gift idea. Thanks so much, I'll be linking. Can I post this on http://mypetitepurse.blogspot.com?? My five year old was looking over my shoulder as I read oneprettything this morning and he INSISTED that we check out your tutorial. Now I've got to make one! Well done. WHat a great idea! I LOVE it and have a little boy that would too! I love it! I am going to make two for my boys. This should help keep them quiet during church. Thanks for posting a tutorial! Thank you SO much for this tutorial! I just finished making one for my little guy's Christmas present. He's just started getting into matchbox cars, and this is going to make him so happy! these are so cool. I just happened upon your tutorial. Wish I would have seen how to make em earlier, I just bought 4 from a little ole lady here in Jacksonville at a craft show this past weekend. She named hers Carages. I guess it a take on cars and garages. Anyway, was looking for a tutorial to make one more. Thank you. I just finished making 2 of these for my 2 boys. They are going to make great Christmas gifts and I can't wait to keep them in the diaper bag...I know it will always keep them busy, without me having to dig around finding cars! Thank you for the awesome tutorial--it made it so easy to make these!! Thank you for the tutorial. I just made two today! One for my nephew and on for my son. They turned out great and were easy to do. Thank you for this tut! I made two the other night. Check them out on my blog! Thanks for the tutorial. My 3 little boys are going to be thrilled when they unwrap these on Monday in anticipation of our long plane trip to see family for Christmas! I just posted pictures and linked back. The tutorial was fabulous! I've posted a link to your tutorial on my blog. I love your site and ideas and have bookmarked you for other great ideas! I just love this Idea, I've posted a link as well to my craft blog. Thanks so much for sharing your great tutorial. What a great blog! Thanks for the tutorial! It helped guide me as I made my own version! Hi Sharla, I tried your tutorial and linked back. Thanks for sharing your pattern! Hi Sharla! Thank you so much for sharing your tutorial. I tried my hand at it & just LOVED how it turned out! Here's a link back to my post! Thanks again! What a great project!! Thanks for helping us kick off the start of our blog! One more thing.... I couldn't find the text to put your button on my blog... If you get it working, please let me know because I would love to grab your button. Thanks for your comments on our blog! 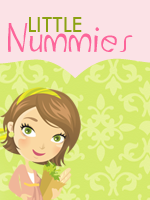 We actually created the site ourselves using some blogger tips we got online. One of our favorites is jenieshell. Thank you so much for sharing this! I just made one - my very first sewing project. I bought a sewing machine last year, but have been very nervous to get started. But I feel much more confident now that I have made the car cozie and know that I could do more! It's lovely to be able to make and create! Thanks again! These are so cute! I love looking at all the variations with the car caddy! 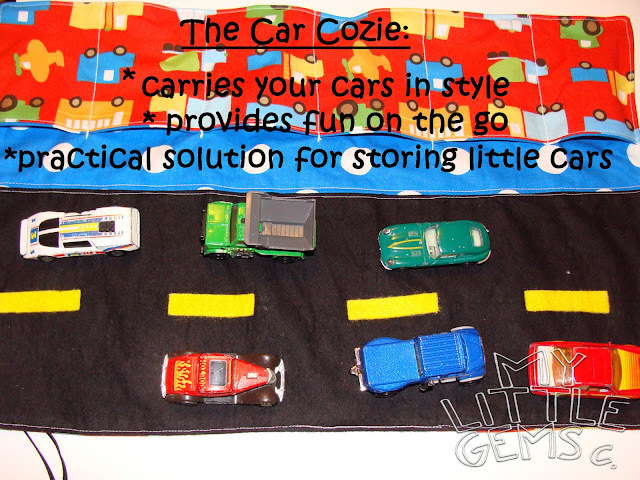 I made a car caddy recently (based on Jill's tute) and had so much fun with it. Even better, my son plays with it regularly, which makes all the effort totally worth it. I think I'm going to have to try making one like yours soon just for the fun of it. I love the fabrics you used! This is such a great idea for my nephew. I never know what to give him for gifts, but he's crazy about cars. This will be perfect! Thanks for the tutorial. Hi, Sharla! I love this project; thanks so much for taking the time to share the tutorial. I just linked to this at Sewing and Growing. I tried to post the link below, but I had trouble...sorry, i am new to blogging and trying to figure it all out. Thanks again for this tut! Thanks so much for this fabulous idea. You asked for those who made one to leave a comment, so here's mine. This is probably one of the only tutorial that I keep coming back to! Here's my version using both yours and Jill's tutorials. Thanks for the instructions. Thank you for this tutorial. I just finished making one and it came out different than yours. Instead of the backing fabric showing in-between the road and pocket like yours is, the backing part and opening of the pocket is on the edge instead of the middle. I rarely sew and so I'm sure I made a mistake somewhere. It won't change the usefulness of it, in fact I'm quite pleased with my accomplishment. But I have read and re-read the instructions and can't figure out what I did wrong. I don't have pictures up on my blog yet but I will later today. If you could look at it and tell me where I messed up, that would be fantastic. It's been fun to see the other versions your readers have made, as well! This project was easy to make and the results are fantastic! 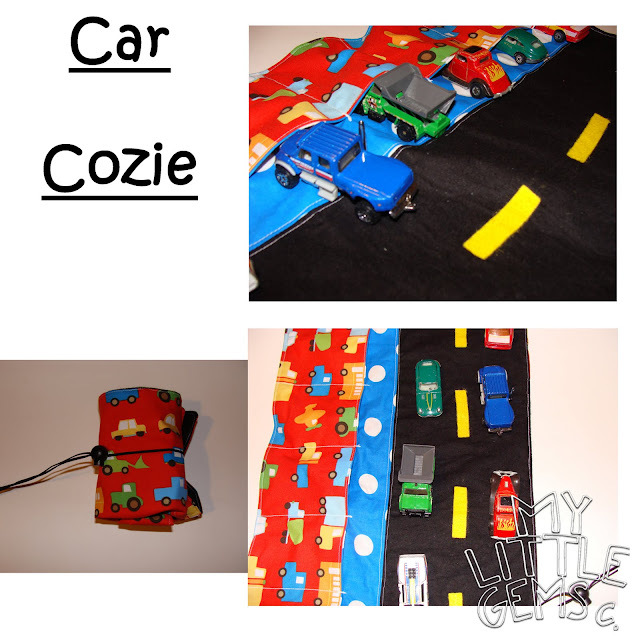 I've received a lot of compliments on this car cozy and have made some as gifts for my friends kids. My son loves to play with his and it is a great, QUITE, activity that he can pull out and play with at church when he starts to get really antsy. I ran into a couple of snags the first time I made this cozy. When getting supplies off of the list of materials, it listed yellow flannel but in the directions it stated yellow felt, which made more sense when I actually got to that part. Also, it wasn't really clear how to attach the ribbon, so the first car cozy I had attached the ribbon to both sides, which turned out wrong but I figured out what went wrong and fixed it on the next one I made. Overall, fantastic project. Fast and easy to make and passed my little critics test! I didn't do the road part, but used the rest of your tutorial! Thank you for this tutorial. I made a similar one for my little nephew. He loved it!!! Thanks for the tutorial! Just made my first car cozie, I think I'm addicted! 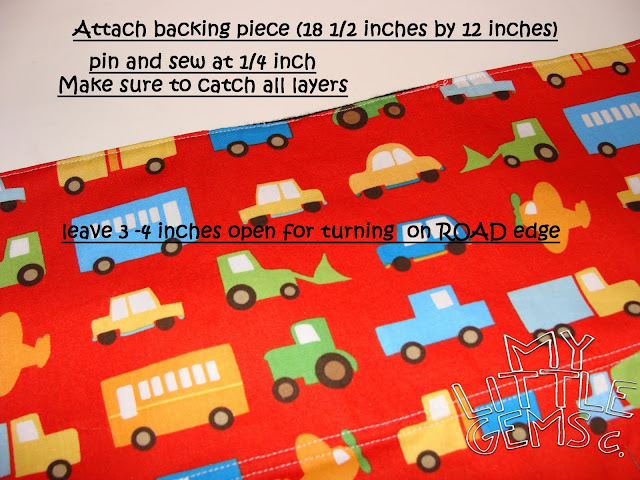 I am in the process of making this adorable cozie for my grandson; however, the backing is short by 1/2 inch. I measured and re measured my pieces, what did I do wrong? This is so cute! I just made this for my grandson for Christmas - so cute! I am sure he will love it! Thank for this great tutorial. I just made one for my Christmas Salvation Army Angel gift for a little boy who likes cars - included the cars as well as part of the gift. Quick, easy very nice gift.